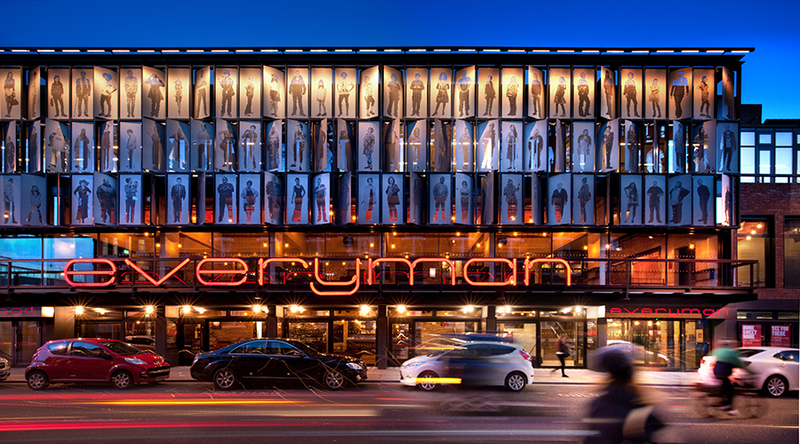 The Everyman Theatre in Liverpool, England—a cultural institution with a democratic spirit and a history of producing thespian talent—has topped the competition including Zaha Hadid and won the much sought-after 2014 Stirling Prize from the Royal Institute of British Architects (RIBA). 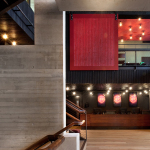 The new building, designed by Haworth Tompkins, a London-based firm boasting of more than a dozen theater projects, replaces Everyman’s former home in the shell of Hope Hall, a 19th century dissenter’s chapel. 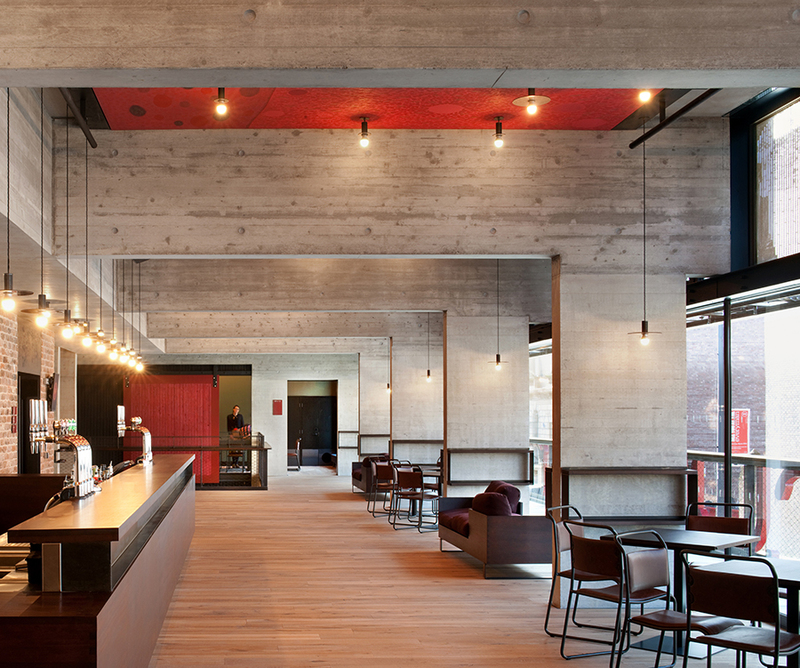 Completed in 2013, the new venue now features a 400-seat auditorium, a series of creative workspaces, a sound studio, a “Writer’s Room,” and dedicated spaces for community groups, in addition to a bistro in the basement, a street level café, and several foyers and catering areas. Roughly 25,000 bricks from the original chapel were salvaged and reused for the wrap-around auditorium. 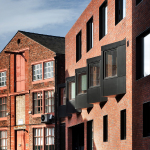 This is just one of many sustainable strategies employed, with the goal of achieving a BREEAM Excellent rating, including rooftop rainwater collection, locally-sourced and recycled materials, natural ventilation systems, and a combined heat and power unit to reduce energy consumption. In conceiving the design, the architects sought the feedback of Liverpool locals. 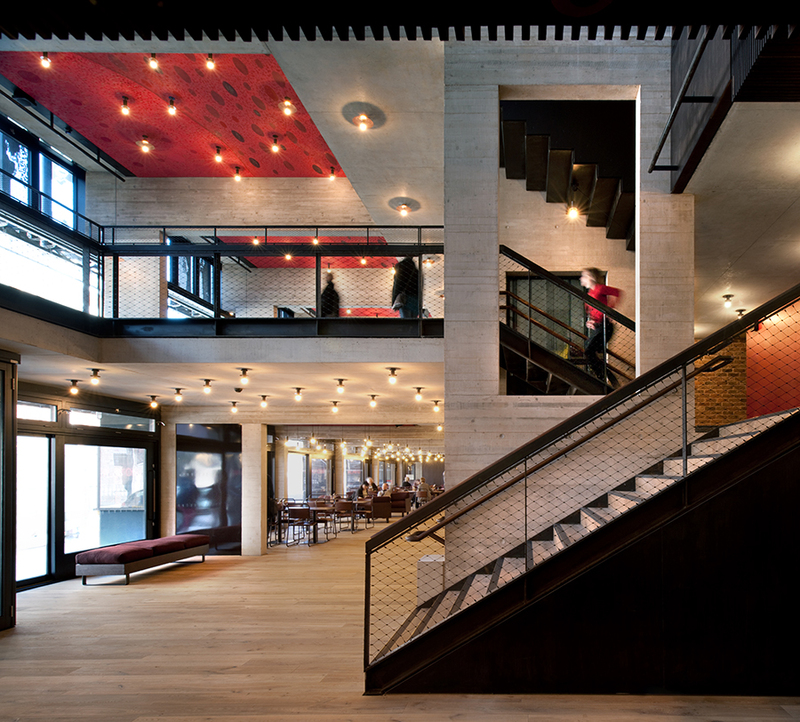 The theater’s community-oriented mission is reflected in the “Portrait Wall” mounted on the west-facing facade, which is comprised of 105 aluminum sunshades featuring life-size images of the city’s residents. 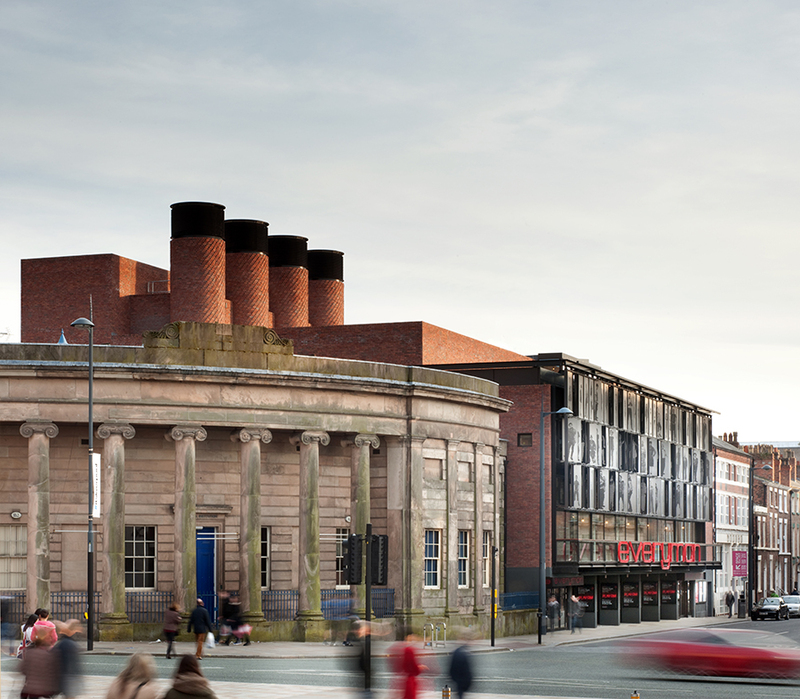 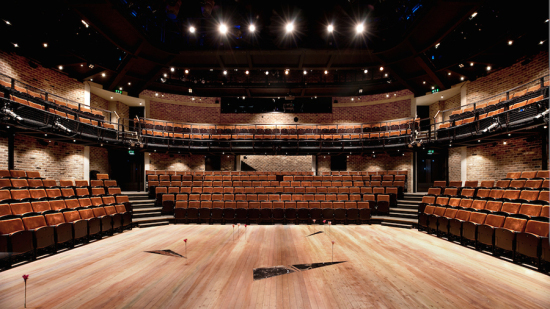 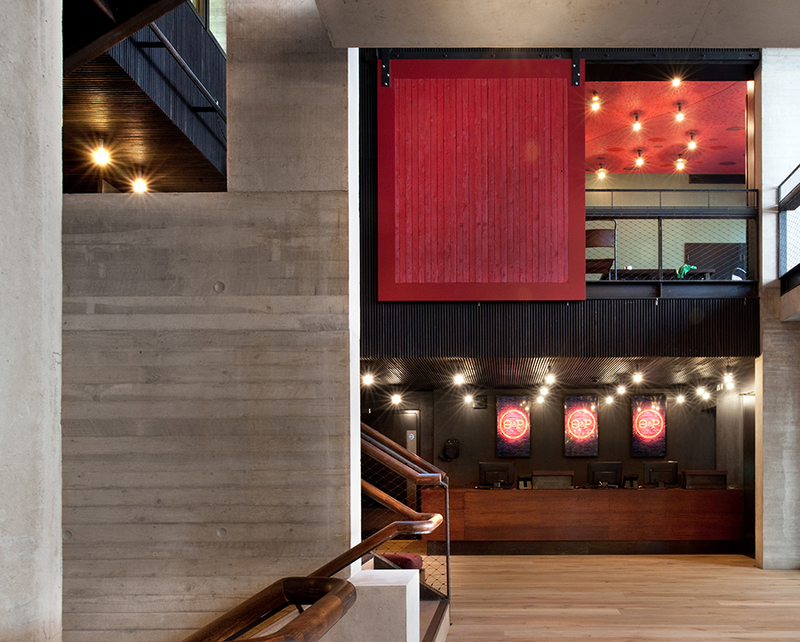 “The new Everyman in Liverpool is truly for every man, woman and child. 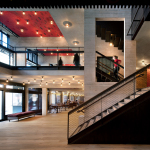 It cleverly resolves so many of the issues architects face every day. 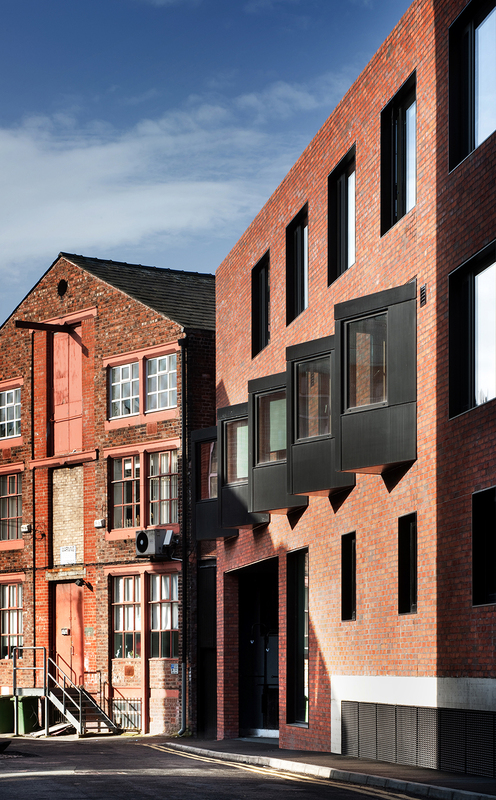 Its context—the handsome street that links the two cathedrals—is brilliantly complemented by the building’s scale, transparency, materials and quirky sense of humour, notably where the solar shading is transformed into a parade of Liverpudlians,” the judges said in a statement. 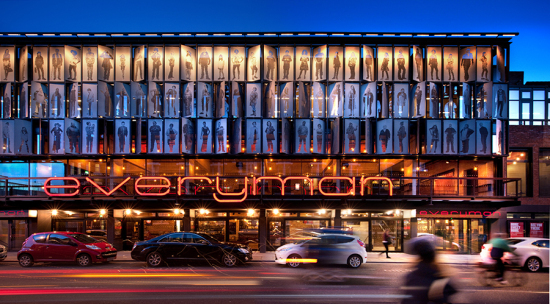 Everyman Theatre beat out high profile projects on the shortlist, such as: Mecanoo’s Library of Birmingham, London Aquatics Centre by Zaha Hadid Architects, London School of Economics by Saw Swee Hock, Student Centre by O’Donnell + Tuomey Architects, Manchester School of Art by Feilden Clegg Bradley Studios, and The Shard by Renzo Piano Building Workshop.